This play had the interesting premise of two, well-known industrialists, each of whom in their own way, was at the top of the British electronics industry and having a high public profile. In terms of personal temperament and style, they were as different as say James Hunt and Nikki Lauda or Bjorn Borg and John McEnroe. In many ways, the 70’s and 80’s was a time of great contrasting double acts compared to our present time in which so many of those at the top in various areas of public life seem to fit into certain moulds rather than displaying greatly differing character traits; a quick look round at the main political party leaders and leading sportsmen surely illustrates this point! Alan Sugar’s persona has effectively been well documented through his appearances on the TV show ‘The Apprentice', as the straight talking, no nonsense East Ender market trader turned multi-millionaire. For those who remember when he was regularly in the public eye, Clive Sinclair was the quietly spoken, industrial academic; proud to talk about his achievements without ever being brash or flamboyant. I arrived at the venue, the nicely compact Pauper’s Pit Theatre, interested to see how this confrontation between two titans was going to be played out. The play starts with Clive, ‘Sir Clive’, arriving early at the restaurant in a state of almost nervous tension as he goes through his proposed ways on tackling Lord Sugar, who in those days was simply ‘Alan’. This was handled well but it did effectively tell the audience right from the start that Clive was on the back foot; effectively the underdog. This impression was reinforced by Alan’s powerful entrance and we soon learn that the value of Clive’s company had fallen massively over the last year and is in a state of heavy indebtedness. What starts as negotiations for a business deal soon develops into statements of, if not actually ethics, certainly differing moralistic viewpoints as Clive’s desire for a fair deal is matched by his concern for the jobs of workers at his Scottish factory, in contrast to Alan’s overriding view that it’s a tough world, governed by market competition and that maximum efficiency is ultimately in everyone’s interest. It seems that Clive was driven as much by the desire to give people practical, cheap electronics as he was by simply making money. However, the seriousness of, and also the issues behind, the business deal, are well tempered by the clever use of consistent comedy. The characters come over as real and credible in a tough environment but the contrasts between them produce frequent humour, brought over by excellent acting and timing. A good example is Alan making out he knows all about Japanese food and ordering his ‘usual’, only to be served bangers and mash, just as Clive is struggling with hard to digest, exotic cuisine. The fact that as the meal progresses, the two protagonists are served real food and drink, with all the correct trimmings, gives a sense of realism to the unfolding confrontation and the Japanese waitress, played delightfully by Jess Lee, is used to great effect as a device to, at varying times, bring each of the two main characters down to earth and pop their ego bubbles. Both Matthew O’Neill, as Alan, and Daniel Thackeray, as Clive, really get inside their characters, who warm to each other as the play progresses, and give the audience food for thought as to what are the best or most realistic motivations in business, and whether these can ever be combined. The breaking of the fourth wall near the end of the play, is both unexpected and handled well, telling the audience that there is more to Clive’s character than they had led to believe. The finishing of the show with a song, was also a nice touch, avoiding the melodramatic need to end for a clear victor triumphing over a fallen opponent. This was a very enjoyable play in which made two well-known public figures come over as very human and interesting. 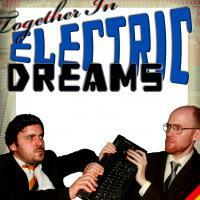 ‘Together in Electric Dreams’ is a good blend of comedy and serious, real issues, alternating between the two throughout so that there is never any drop in pace at any point in the play.